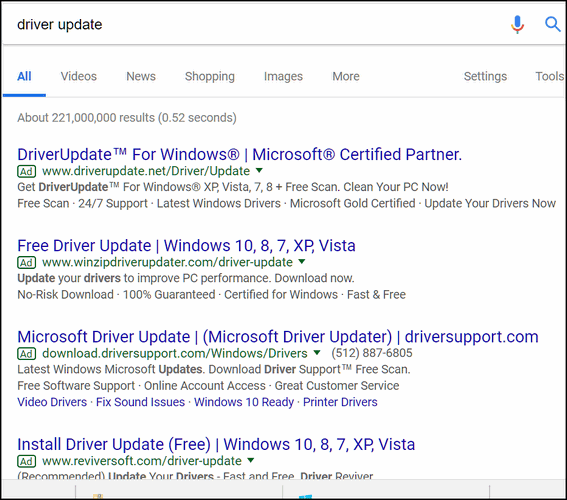 There are enough scams on the web without bringing them to your PC with a poorly worded search. In this short tip, we’re going to give you a few tips on what you can do to avoid causing yourself big problems by poorly worded searches – and a heads up on how to read a URL. If you click that, you will not go to Microsoft’s web site, you will go to one of our pages. This is the easiest deception to do and the easiest to detect. In most browser, you should be able to hover over that link and tell right away where you’ll end up if you click it. Your can also right-click it and copy the actual URL and paste it into Notepad or an email and see where it leads. If you’re not paying attention, you’re tired, distracted or otherwise not concentrating, you may see the Microsoft support and click a link like that. But it would not take you to Microsoft, it would take you to Marvy PC where you may find yourself in an tech support scam imbroglio. And you sure don’t want that. If you clicked them, not good. But if you did or didn’t #2 is the correct link to Microsoft’s support site. The other two will lead you into never-never land – but luckily for you, we have your back. We fixed the bad links to they go to a safe page. 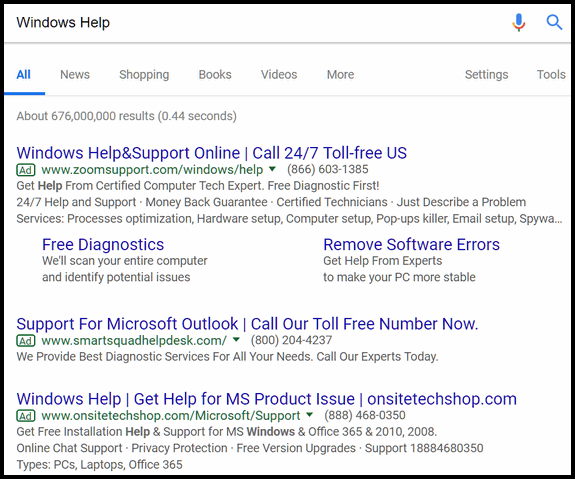 When you search you need not only be wary of the links you’ll see, you’ll need to be careful that the search result(s) you’re clicking are not ads or scams or worse. Many many people have been taken down he primrose path by the words “Microsoft Certified Partner”. It means nothing. It doesn’t mean what you think it means – it does not mean Microsoft approved a site or service. You can see that this uses a trick. 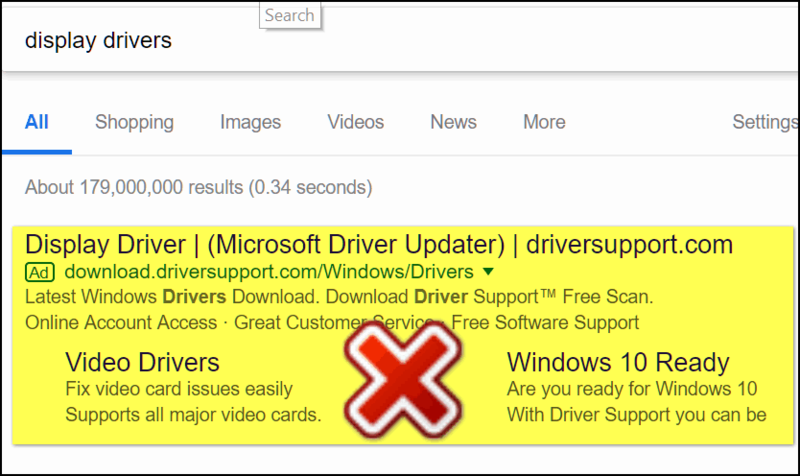 It uses the brand name Windows in the URL, and in “Windows 10 Ready” thus making it appear that this place has the right drivers for your Windows 10 computer. You don’t need to update your drivers if everything is working right. If you did need drivers you need them for devices not for Windows 10. Above: A truly terrible search term – guaranteed to get you in big trouble. At least all of these search results are labeled “Ad”. In search results like these, think “Ad=Bad”. Note how often the word Microsoft and Windows and Windows and Windows versions are used to mislead you. Don’t fall for this kind of trickery. Below: We type in another popular but BAD search term “Windows Help”. Not one of these has anything do with Microsoft support or help from Microsoft. And notice (below) how far down you have to scroll before you find real the real Microsoft and the real Microsoft support site. 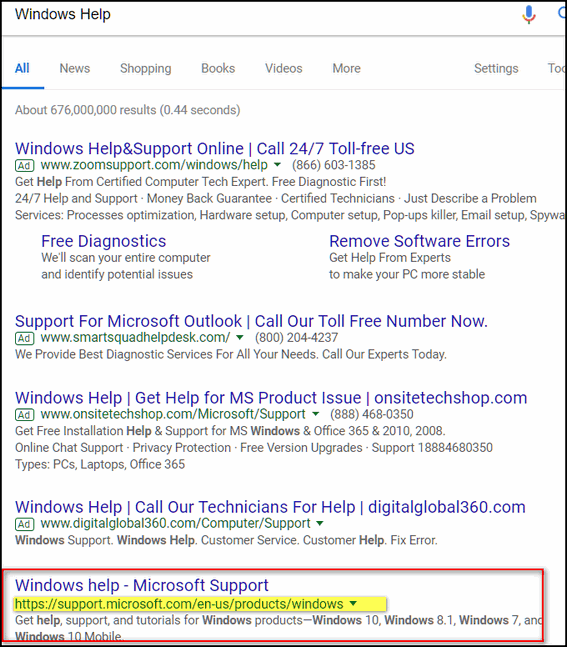 And worse, if you keep scrolling you’ll see other help/support sites using the word Microsoft and Windows that are not labeled “Ad”. Of course, this does not just apply to searches for Microsoft support, Windows help, or driver searches, it applies to almost anything where there’s money to be made either by getting you to call a number, download something or scaring you into buying something. The 2nd and 3rd testing links you give are the same. I don’t understand the difference. Look at the spelling of Microsoft. There is the difference. Wow just shows you how easy it is to be fooled and how careful you have to be. I was agreeing with Arline about the 2nd and 3rd links until I read Kathy’s reply. It is a well know fact that our brains work to allow us to see what we think we see so that both of these links originally look exactly the same. We expect to see the word Microsoft so that is what we see. It is only once the fault is pointed out that it becomes glaringly obvious. It’s a wonder that more clients don’t get scammed. This is valuable information. We need to take note. Thanks loads for the “heads up”. I got it the other day trying to get help from Google/Gmail. I’m ordinarily pretty astute in these things but I guess I forgot myself! I finally found a web site to chat with someone about one of my gmail accounts. luckily I did not really divulge any sensitive information. just the problem I’m having. All of a sudden she posted something like.. “is there any other information you would like to provide to me before I con you some more!”!